So Jenn and I are putting our feet down. What is so wrong with ground beef? Why is it that, outside of a burger, ground beef has been shunned from the foodie lexicon so completely? Want a burrito? Steak, fish, or carne asada, those are your choices. Ground beef? Get out of here, you riff-raff excuse for meat! This is the same riff-raff you used to make your gourmet burger! Nice, fresh, ground beef is good, man! And you eliminate the almost ubiquitous toughness that comes from using steak. Oh, I suppose it has something to do with the meat not being rare when served, but that’s okay. Cooked meat is good too, especially with all the right seasonings and sauces mixed in! Think about how many dishes you enjoyed as a kid with ground beef in them. Well, this recipe is the first step in our plan to bring ground beef back. It can be every bit as juicy as any other meat, the texture is consistent and tasty, and it is a great partner to spices and sauces like those in this homemade Stroganoff. Bring a large pot of water to a boil. Cook egg noodles according to package directions. Melt the 1 tablespoon butter and olive oil in a large sauté pan over high heat. Once the butter has melted and the bubbles in the mixture have started to subside, add the chopped mushrooms. Stir continuously, allowing the mushrooms to absorb the butter and oil mixture. After a few minutes, once the mushrooms have begun to brown and release their juices take off heat. Set aside. In a medium bowl, use a fork to mix together the ground beef, Worcestershire sauce, allspice, black pepper, paprika, and white pepper. In a sauté pan, melt the remaining two tablespoons of butter over medium heat. Add the shallots and cook until soft, about 5 minutes. Add the garlic and cook for another minute. Add the beef mixture. Stir the mixture, being sure to break up any large pieces. Once the beef has browned and is no longer pink (about 6 or so minutes), stir in the tomato paste. Cook for a minute then add the browned mushrooms, beef broth and port. Turn the heat to medium-high and bring to a boil. Once the mixture has reduced a bit, take off heat and mix in sour cream. Serve with egg noodles. Hmm. 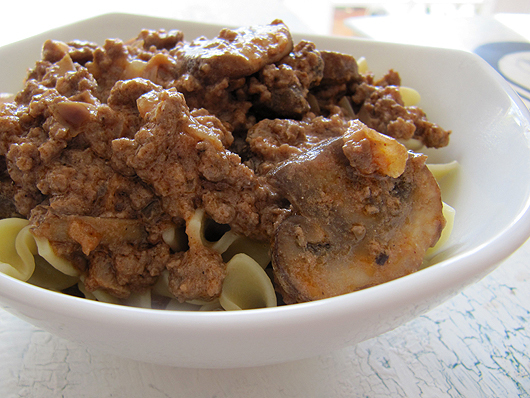 Stroganoff with ground beef. Interesting idea. I'll put this on my list of things to try. Thanks. Good point on the ground beef! This looks like an amazing recipe, have to try it. You have a great blog with great recipes. I think beef mince is really versatile, good for something like this as it might be cheaper! Interesting to use it in a Stroganoff, I'll need to remember that one. I would join a campaign to bring back ground beef. We could even have a weekly ground beef link up (I'm only half kidding ;) We try to have ground beef once each week. The recipe looks delicious. We love beef stroganoff. I love Stroganoff! And this is a great recipe for a classic dish! Look forward to trying it! I really enjoy reading your blog, it's one of the cutest blogs around! Good questions as to why it's snubbed. My husband wouldn't snub this for anything. Hope you enjoy your weekend. I also love ground beef although I have to admit I've been eating much less of it recently. Mostly that's because in Israel it's pricey and often not that great, so I've been turning to freshly ground turkey breast more and more. But I wouldn't turn down this beef stroganoff for anything! Looks amazing. And I love your blog! Thanks, Katherine! We also love freshly ground turkey breast. It's a real honor to have you to our site! Don't be a stranger! I make my stroganoff with ground beef, too...but I never use a recipe. The last time, I thought it needed a flavor boost, so I'm going to merge our recipes for my next batch :) Thanks for the inspiration! Thanks! We'd love to know your recipe. I love ground beef! More so than steak. But I'm a weirdo. Your stroganoff looks tasty! I'm a sucker for ground beef and noodles. You're not a weirdo! We're both the same way. first time in your space n i loved it absolutely .....the meal looks scrumptious....especially ur clicks r making me hungry....following ur space.....do stop by my space sometime ! I love ground meat! And as a pasta sauce it is just delicious! I love stroganoff. Always had it with little chunks but the ground beef sound good and it looks delicious.